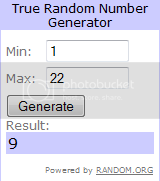 There were 22 entries for the No Turning Back: A Witness to Mercy giveaway. I've got a lot of spiritual reading suggestions now. Thanks, y'all! I think the most popular book was St. Faustina's Diary. I've never read it cover to cover, though I open it at random in Adoration sometimes and always receive solace. It breaks my heart that there can only be one winner. I was truly rooting for everybody! If I were Oprah I'd just give everybody a copy. If I were Oprah I'd also give everybody a car. But then I wouldn't be a farmer's wife. I think I'll just give away one copy and stop dreaming of Oprah's riches now. Randomly selected from Random.org is comment #9. Congrats, Sara!! (As if winning Jeopardy wasn't enough for you, you had to go and win the City Wife, Country Life giveaway. Some people have all the luck). Contact me within 24 hours to claim your amazing prize (or else I'll re-gift it). This was a lot of fun. I think we'll be having more giveaways in the future. Everybody can get a Free Limeade Sparkler from Taco Bell! So in the end everybody wins.